A friend of mine called the other day just after I'd finished listening to a webinar on the UN's new Sustainable Development Goals, or SDGs. I was feeling somewhere in between sad and seething, and my friend asked if it was because the webinar was all doom and gloom. "Hell no," I responded. "There wasn't *any* doom and gloom! That's what got me so upset!" Here's what happened. The webinar was put on by a world-renowned expert in the field of sustainable development (and if you're not familiar with my stand on sustainable development as the most transformative new paradigm to come our way in ... well, since forever, check out this post) through a network of sustainability professionals: people who care enough to be doing this stuff for a living. I have to admit that I'd lost track of the UN's "update" of their Millennium Development Goals (which, although some of them have been deemed "met," didn't slow the climate crisis one iota, therefore any successes will soon be moot), so it was great that this fellow brought us up to speed. But when "Climate" wasn't listed as a top focus area, I started to get worried. Sure enough, turns out it's #15. Out of 19. I was completely flummoxed! But then I got really worried when, after noting that Focus Area #2 is Food Security and Nutrition (that's good), I had to read waaaaay down before I found this subgoal: "strengthening resilience of farming systems and food supplies to climate change." Throughout our discussions, the group emphasized that eradication of poverty, inequitable development within and among states as well as protection of the environment are amongst the most pressing sustainable development challenges facing humankind in this century. The sessions were guided by the consensus that the SDGs should be action-oriented, concise and easy to communicate, limited in number, aspirational, global in nature and universally applicable to all countries, while taking into account the different national realities, capacities and levels of development and respecting national policies and priorities. 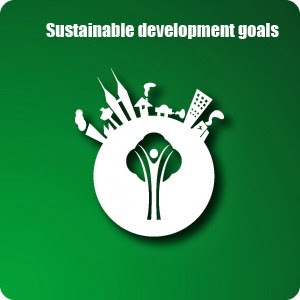 The goals should address and incorporate in a balanced way the economic, social and environmental dimensions of sustainable development and their interlinkages. Climate change poses a grave threat to sustainable development and poverty eradication. Some areas to be considered include: reaffirming and reinforcing international commitments, such as limiting the increase in global average temperature through equitable reductions in greenhouse gas emissions; providing effective means of implementation; building resilience and adaptive capacity in developing countries; with a view to reducing global emissions of greenhouse gases, introducing inter alia economic incentives for investments in low-carbon solutions in infrastructure and industry; developing low-carbon, climate-resilient development strategies and plans. Regard must be paid to the principles of the UNFCCC, including that of common but differentiated responsibilities and respective capabilities, and to supporting and urging greater ambition in the ongoing negotiations towards a strong and effective agreement in 2015. 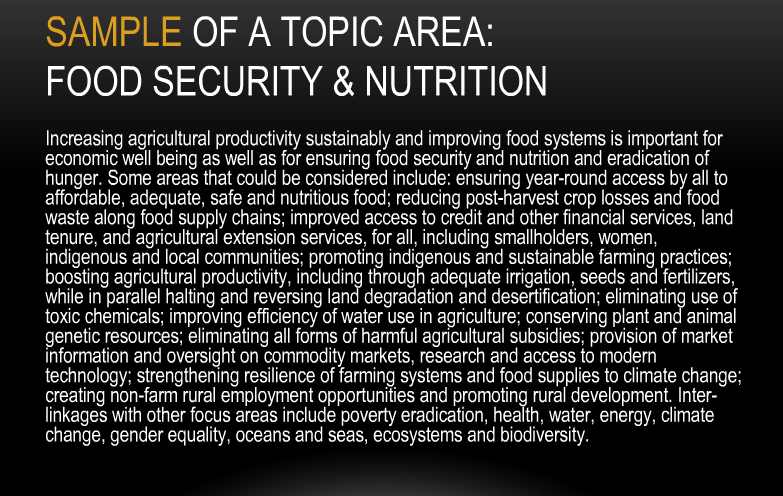 Interlinkages to other focus areas include: food security, water, education, health, energy, sustainable consumption and production, sustainable cities, oceans and seas, ecosystems and biodiversity. See any, uh, problems there? A "grave threat to sustainable development and poverty eradication"? Are they kidding me? It's a grave threat to the survival of most life on the planet! An area "to consider" is "limiting the increase in global average temperature through equitable reductions in greenhouse gas emissions"? How about every single gawddamn nation in the world achieving the goal of zero carbon emissions by yesterday? Perhaps the SDGs should be called "intentions" rather than goals. Because unless we make big leaps in survivable development, these goals are just nice aspirations floating on the breeze. See why I got so upset? That's where we're at on a global level. Then later that evening (do you ever do this? ), I got watching a whole pile of videos online. I couldn't stop. They were so inspiring and exciting! I think I'm going to watch some more today, in fact. They're permaculture videos by Geoff Lawton, a wonderful permaculture teacher who works all over the world. These videos have really helped me solidify the principles that I learned in the Permaculture Design Course I took two years ago. One of the three ethics of permaculture is Earth care ("the Earth provides us with everything we need, so we need to think beyond 'sustainable' to 'regenerative.'") And Geoff Lawton knows and understands the multiple threats we're facing. He's doing everything he can to help people learn how to survive multiple crises (water shortages, food shortages, fossil fuel energy shortages, climate disruption and erratic weather, etc.). So I'd like to leave you with a link to Geoff's video website. You might have to give them your email address, but that's just so they can let you know when the next video comes out. 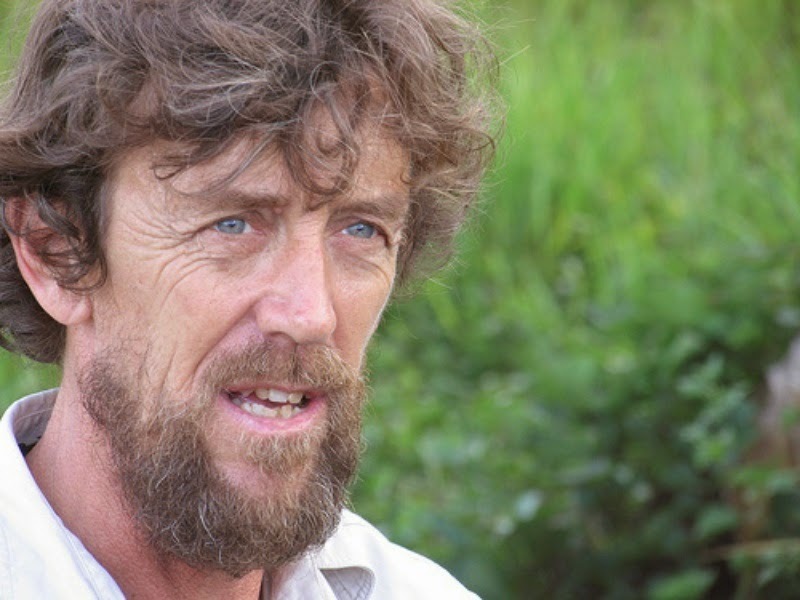 If you have any interest in survival or water catchment or land restoration or greening the desert or growing an abundance of food in your own backyard, take a bit of time to watch Geoff's videos. Picturing THIS happening locally is what keeps me going when I get down about the rest of the world insanely ignoring what's happening. So please enjoy!